You may get misled by the appearance and size of this sleek but weird creature; besides that trust my words, you will thank me later for adding this wonderful species to your list of baits. And who knows, you may fall in love with its simplicity, vivid colors, and charisma which induces a charm in all the fishes around when it slowly sinks to the bottom of the water beds. As there can be many ways to accomplish a task, some may work better than the others. On similar grounds, there are different techniques (1) to rig a Senko, to prepare it as an appealing bait. I am briefly explaining all of them to get the burden of exploring each one, off your shoulder. However, I leave it altogether to you to decide which one works best for you. So do give all the methods listed here a try, before you find your favorite pick. My favorite technique of rigging a Senko is Texas Rig fishing, or to pronounce more clearly Weightless Texas Rig Fishing. To accomplish a Texas rig, you first need to push the hook about half an inch deep through the center of the thick end of the worm before finally taking it out. 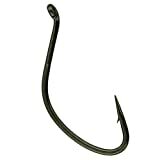 You will require an offset shank worm hook with a wider gap for this step. Gradually slide the worm to reach the offset area of the hook shank so that it completely hides the eyelet and knot. 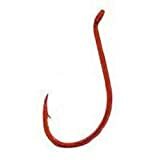 Keep the worm straight to figure out where to stab the worm so that it aligns straight with the hook. Push the point of hook perpendicularly through the body of the worm, ensuring at the same time that the worm aligns straight, with the point of hook lying close to the body. The trick is that the worm should not get curved or crooked while pushing the hook to ensure a natural flow of the bait in the water. Don't forget to tuck the protruding point of the hook into the body of the worm to ensure a steady movement through weeds, snag, and moss. With a little practice, you can master the art of Weightless Texas Rig (2). You may find it difficult to view the floating line on windy days or turbulent waters. However, a little practice will enable you to reduce the slack to a minimal amount. Senkos are delicate creatures and may wear out with every catch. However, you can reuse the rigged Senko by re-rigging at the tail. Pull the tip of your rod aggressively up and back if you see the worm splashing down. Once you have lowered down the rod back into the water, you will get the required slack. Alternatively, you can consider putting a little weight on your bait with Light Texas Rig or Weighted Texas Rig. For this, you can attach a 1/4 to 5/8 ounce bullet sinker with your bait. Attaching a weight eliminates horizontal fall and allows the bait to sink through dense grass, flooded beds of bushes, bloggy surfaces, and other intense covers. This technique is best suited for bass fishing (3) since it allows the bait to reach the bass fish which usually inhabit slightly deeper waters that are otherwise unreachable. To set up a Weighted Texas Rig, you need to reeve your line through the bullet weight before finally tying it to the hook. After that insert the hook into the head of the bait about ¼ inches deep. Keep moving the bait towards the offset area of the hook so that it completely hides the eyelet of the hook. Slightly rotate the bait by 180 degrees. 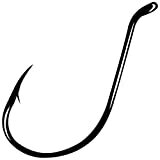 Keep the bait straightly aligned with the hook and penetrate the point of the hook through the body of the lure. Insert the point of the hook through the skin of the worm. The Wacky Rig style involves digging the hook through the midsection of the worm. This action sets both ends of the worm free to flutter in the water, which lures the fish to take a bite. This technique is best suited for shallow and clear waters, grassy and rocky banks, around docks and under boulders, and possibly any river bed. Don't forget to pop the slack now and then to get some marvelous catch. This method has proved very productive for me when targeting shallow covers. To set up a Wacky Rig, first, determine the exact midsection of the bait and then merely pierce the point of the hook through the exact center of the body of the lure. This technique involves attaching 3-4 inch Senko on a drop shot rig. Suitable for vertical fishing, Drop Shot rig performs best in clear waters with a depth of up to 20 feet or more. In this technique, you need to fasten a drop shot hook with a Palomar knot style about 3 feet on top of an egg sinker. Finally, you need to pass the hook through the nose of the Senko. Drop the rig straight such that the weight rests at the bottom. Hold the rod parallel to the water, and reel the line until it gets taut. The rod tip is then dropped and lifted alternately without lifting up the weight from the bottom. 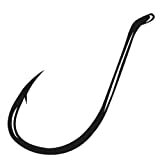 With each drop, slack is created in the line, thereby letting the Senko attract the bass and other fishes by falling and fluttering horizontally. Not a much-talked-about but sure shot technique to get a catch in unnumbered double digits. In Carolina rig, you need to attach a weight about 3 feet on top of the bait on the line. The weight on top directs the movement of the bait in the water. Guided by a slow fall, it allows Senko to wave and float slowly back and forth. Best suited to target fishes on shell beds, facade walls, rock-strewn points, and river bars. To set up a Carolina rig, you need an offset hook, a bullet sinker, a barrel swivel, one bead, one bait, a set of XPS finesse weights, and an Excel monofilament line. First, slide the bullet sinker onto the line followed by one bead. Attach a barrel swivel at the end of the line. Attach a leader to the barrel swivel about 12 inches to 30 inches in length. Finally, tie the offset hook to its other end. Attach your bait to the hook as done in a Texas Rig style. Your Carolina Rig is ready to grab a good catch. Hope you enjoyed the journey of rigging a Senko with me. At this point, I leave you here with this techy talk about making the most of a bag of Senko in your hand to get a handful of meaty delights. As you try your hands on these techniques, you will feel delighted as well as surprised discovering the thrill and excitement involved in every new approach. So, get your boat sailing, and let these techniques work wonders for you. Don't forget to put your experiences in the comments. Share this article with your friends and peers if you find it useful. Really super and very useful information.